No, I'm not going to Blog 365, though I might help to provide a little fodder for other.crazy.people. I did get an "A" in one of my classes... and a "B" in the other... but that's not it, either. It's the ABC-Along! Inspired by the great ABC-Along of 2006 and with the blessing of Anne, I've decided to "host" ABC-ALONG 2008. I had such a great time doing it in 2006 and I've missed it for all of 2007, so it's time. Disclaimer. I run a pretty loose group and/or -along. I'd much rather knit or read or take pictures or cook or do laundry or clean the bathroom (you get the idea) than run admin (you've been warned). I love a party, however, so let's get one started. I'm interested in stirring up some creativity! This project is wide open to interpretation and personalization. What does it mean to you? Have a little fun; take, post, and let's talk about some interesting pictures -- see where it goes. I've started both a Flickr group and a Ravelry group for ABC-ALONG 2008, and you are hereby invited. The Flickr group is public/invitation only -- the last day to request an invitation to the group is January 19th; sign-ups will be closed as of January 20. Please request an invite by leaving a comment on this post or sending an email (vknitorious @ gmail .com) with your Flickr ID. By nature, Ravelry is open all night... we'll see where it goes. Members in this year-long group -- knitters, spinners, fiberists (yeah, I like that!) -- post a photo to their blog and/or the Flickr group every two weeks to correspond with a letter of the alphabet. Photos can be related to fiber, but do not have to be; they should reflect the personality of the photographer, and something of importance or meaning to them. Post at least one photo in each 2-week period to match the corresponding letter of the alphabet. There are 52 weeks in a year and 26 letters of the alphabet, allowing two weeks per letter (Weeks 1&2=A, Weeks 2&3=B). Example: "A" is for... Alaska, asparagus, alpaca, astronomy, aperture... Whatever you choose, it should have some meaning for you. I know a lot of people got new cameras for Christmas. Maybe "A is for aperture" and "B is for (white) balance"... "F is for f-stop"... or "focus"... and perhaps the tone is set for exploring the new camera, its features, and photography in general. Photojojo has some great ideas. More to come as is warranted, including a hard-and-fast schedule and a button/banner. To kick things off just right, everyone who sends me a comment or email request by the deadline (that would be January 19th) will be entered in a drawing for a book that I happen to have an extra copy of, that happens to begin with "A." I did not get a new camera for Christmas, I must make do with the old. It has served me well these many Christmases, sometimes taking pictures of Christmas things. Katie decorated this ornament for us at my sister's last month. I never put 2 + 2 together when she told me she'd gone out there, and even when she said that decorating had been done (Mack made a few ornaments -- and was chatting up the customers quite a bit, too! Can I help you?). The slip-trail technique my sister uses is called "ditzwork" and Katie's interpretation and design make me think Ditz meets Yellow Submarine. I love having an excuse to post pictures! Of things that matter to me, oh yeah. Now I just have to remember. But I will. Hmm, I already know what A is for. Can I do more than one? I just thought of another A thing. Vicki, I would love to participate in the ABC-Along 2008. I really enjoyed your 2006 participation from a reader's perspective and I'm looking forward finding inspiration behind the camera. I'm Purling Oaks on flickr. Yay! I, too have missed it this year - I find myself thinking about it every once in a while (this would make a great a,c,f,x, etc.) I'm super excited. My flickr ID is jenntx. Woo Hoo! 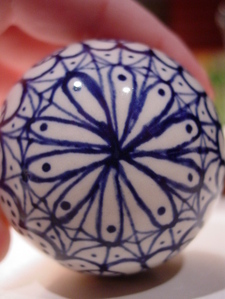 That ornament is GORGEOUS, and of course those of us crazy enough to "365" need blog fodder, so ABC it is! You are right! I am in! Any excuse for a post. I don't know if I will always get them to the flickr site, but I'll work on it. The ornament is gorgeous! Another thing I'd love to know how to do. Hmm...do I give it a go? I certainly enjoyed all the posts last year...and you did say Alaska. 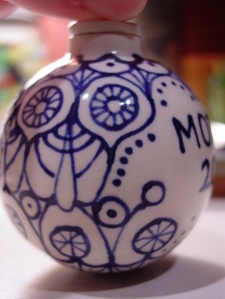 :) Lovely ornament. 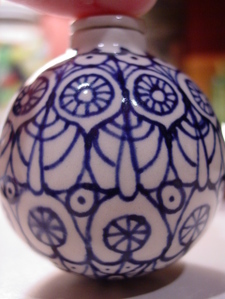 When I first saw the ornament I thought it was Japanese porcelain, maybe a lamp finial. 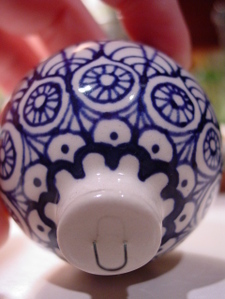 I love that blue and white porcelain stuff! I'd like to join in the ABC thingy. My Flickr and Ravelry IDs are both kmkat, same as my blog. Thanks for doing this! Oh, count me in! :-) Especially since I am in Blog 365, it will help tremendously!! I loved the first ABC-Along, so I'll give this one a go, too! I'm Not Plain Jane on fickr. ABC along sounds cool! Happy New Year to you and your family. Sounds excellent, I'm in. Do you need help with scheduling and buttons and such? I helped Anne with 2006 and I'm here for you if you need it. Talent abounds in your family! The ornament is fabulous. When my head is clearer I'll think about joining ABC again. I was thinking about it the other day and how much fun it was. I'm in for ABC-along 2008. My Flickr and Ralvry sign-in is ElizabethL. Oh this will be fun! Happy New Year, Vicki! OK! I am in on this. I LOVED ABC-ing along in 2006. Thank you, Vicki. And Happy New Year to you and yours! I wasn't in Blogland for ABC2006, but I'd like to join for this one. Maybe this will get me to actually figure out my Flickr account and posting and get my Ravelry act together. I believe my ID is KarenJoSeattle for both, but I'll double check when I'm not posting from a hotel room on I-5. Thanks for 'hosting' this. I need more structured fall-back posts for this year. I'm in for the ABC Along!! Sounds like so much fun! My flickr ID is kellyjo32, and I've joined the ravelry group! I'd love to join in! My Ravelry and Flickr ID is saffrail. Happy New Year from England! I unintentionally bailed out of the last ABC along but I would love to have another go at it! I'll get back to you with a flickr account. Happy New Year my sweet friend!!! LOVE LOVE LOVE! This sounds like fun, I missed it the last time. I'm in! Happy New Year! Please consider this a request to join the Flickr group. I'll send you my ID when I'm at home with my cheatsheet. I already have my 'b'! This sounds awesome! Please count me in. My ravelry and flickr ids are the same, starrypurplehaze. ME ME ME! I flaked halfway through 2006, but will hopefully complete this year! I'll play. I'm pacalaga on Flickr and ravelry both, though I'll go add myself to the ravelry group right now. I think I'll play along! Please count me in. I meant to do it last year and never got around to it. Thanks! I'm fidgetknits on ravelry and fidget-ann on flickr. Happy new year! Oh, Wow...a chance to take lots of new pictures...I would love to do this. Not only did I get a new camera - I went the whole way and got a new computer!!! So, please count me in...I have flickr!!! I started blogging to late in 2006 to do this and I would love to do it this year, thanks for hosting if for us! What a great idea. I missed the ABC along the first time around but I really loved readiung all of the entries from it. My flickr ID is hcrubin. I'd like to ABC with you this time - flickr ID is zinlizzie, likewise with the Ravelry ID. That is a beautiful ornament. I'd like to sign up! My Flickr ID is Kendiala. I had such fun in 2006.... I'd like to play again! 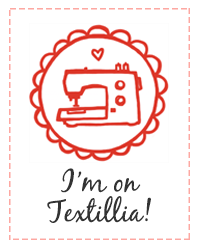 Please invite me to the Flick'r group (my ID is needledancer(and I'll go sign up for the one in Ravelry). Will there be a webring? Yes, please sign me up for the ABC-Along flickr group. I'll join the Ravelry group this evening... My flickr id is alter_ego. Thanks! Oh, I'd love to be part of the ABC-Along 2008! I loved reading your entries in 2006, and need a reason to get to blogging more regularly. Flickr ID is "thief of time". I'll head over to Ravelry and join that group. Yay! Sounds like great fun! My Flickr ID is hyvetyrant. Hi Vicki! Happy New Year! I would LOVE to join! I was always sorry that I missed it the last time around. My ID is Bett's pics at Flickr.